McCloud is discussing the idea that when you go to a new space in a comic, you are in a new time. Scott McCloud, HarperCollins Publishers Inc., pg. 7. I think that comics are something that not a lot of people really read because they do not know much about them. I would definitely say that this was the case for myself before reading Understanding Comics. I thought that comic books could only be about superheroes and other things related to that genre. However, this is not true at all. A comic can be about anything. I think that if people begin to realize this, which I think is a strong possibility, comics could become a much more popular form of literature. I also know that a lot of people really like to read things that have pictures which could potentially make comics even more popular in the future. It is nice to have images that help you along in the reading of a piece of literature. I really liked reading McCloud’s printed book because I think that we so often read books online in some form and I think that this takes away from the experience that reading should be—at least in my opinion. I love turning the pages of a book and being able to write comments in the margins, underline things, and circle things. I think that this is a really important part of reading and helps readers to be able to interact with the text most effectively. I liked that I was able to underline things and make little marks along the way as I was reading this book. I actually really liked the online comics as well. They were so much different to read than the print book which I actually found to be really interesting. I think that online books have their own benefits even though I don’t necessarily prefer them over print. I like the idea that you can easily click back and forth to get to different frames. This makes it really easy to navigate rather than manually flipping pages. I would definitely say that there are many pros and cons to different methods of reading certain texts. 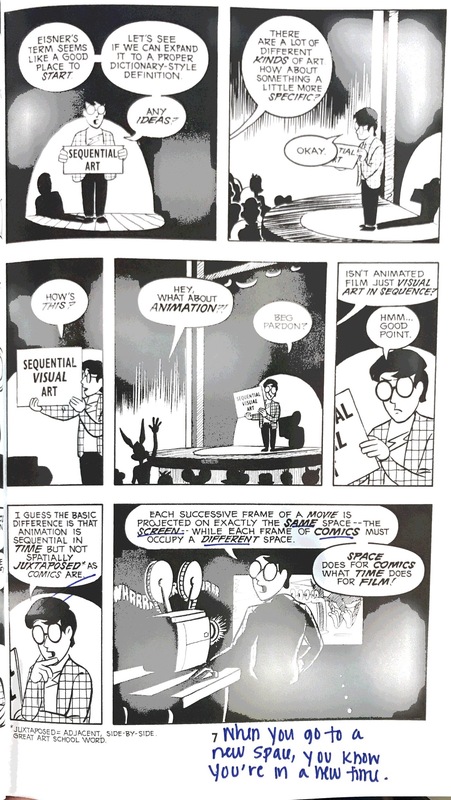 I was very interested in the part of Understanding Comics where Scott McCloud talks about the idea that each time we move to a new frame, we inherently understand that we are moving to a new time. This is something that is very obvious to me now, but also something that I had never thought of before I read this. I think that if I were to make my own comic, I would really want to capitalize on the idea of time and space and their relationship to each other. I think that it would be really interesting to explore a story in which time is moving on in large increments—possibly throughout a person’s life—but the place stays the same.